SALISBURY, MD. (July 19, 2015) –Ice cream may be ubiquitous to summer, but for one dairy farmer in Tuscarora, Md., this sweet treat is much more, it’s part of his family’s story. In 2009, Chuck Fry, and his wife, Paula, were looking for a way to diversify the income from their dairy farm. It was Paula who convinced Chuck to consider making and selling ice cream on their farm. Centrally located off a main highway to Frederick, Md. and Leesburg, Va., Rocky Point Creamery would be able to serve two large metro populations. Several years of research and planning followed, and in 2011, the Fry’s broke ground on the Creamery building, situated at the entrance to their dairy farm. The family started serving their homemade ice cream soon after, and now, there is a steady stream of customers. “We knew our customers would come from Frederick and Leesburg, but actually, we have many customers from Washington, D.C. For them, it’s a destination, a chance to experience a real, live dairy farm,” says Fry. While customers may see the farm as a destination, to Chuck, a fourth generation farmer, the farm is his family’s lifestyle and livelihood. One of the feeds that the cows at Rocky Point Farm turn into delicious ice cream is fresh ground and roasted soybeans. That milk is turned into the ice cream that Rocky Point Creamery customers enjoy. 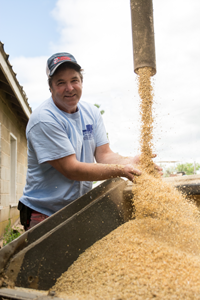 Maryland farmers grow about a half a million acres of soybeans every year, harvesting between 16 to 20 million bushels that are used to feed poultry and livestock. According to the United Soybean Board, animal agriculture in Maryland represents $2.4 billion in economic output, $394 million in household income, and 14,300 jobs. In addition, it yielded an estimated $99 million in income taxes and $48 million in property taxes. To learn more about Rocky Point Creamery, visit www.rockypointcreamery.com.